URGENT – 2 Pups Need Homes. 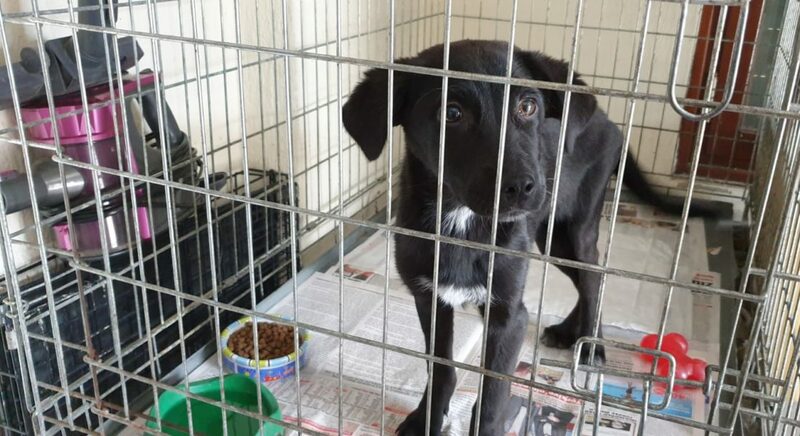 UPDATE – 24th April 2019 – Cosmo has found a home in the UK! Yaaaaayyyyyyy!! Sadly, Blackie/Esme [yes, she has 2 names], is still desperate – please please please share her story and get her off a life on the streets! We have 2 puppies in HQ at the moment recovering from injuries who desperately need new homes, otherwise they will have to go back on the streets or to the dogs home. Blackie and Cosmo were found at Xanthos, together with other siblings, wandering around and getting onto the roads. Both had injuries that were consistent with being hit by cars, so were brought to Kalkan and given a thorough check over and treatment by our vets. They have since been on cage rest at HQ while they recovered and have made great progress. They still need to build up strength in their injured back legs, but that will come over time, the vet is very happy with their progress. Both are very adorable, females, and like all pups, love life and people and interaction. There is a 3rd pup with them, litter mate to Blackie, called Joe, who has already found a new home in the UK and he will be off to foster care later this week. So we really need Cosmo and Blackie to find good homes too, either here in Turkey or abroad. As always we can help and advise on all aspects of adopting abroad and there is more detailed information right here on our website under the Adoption heading in the menu. If you can offer either of these two gorgeous pups a new life, please do get in touch, and if not, please share this amongst as many friends and family as you can and lets try and give 2 more dogs a great start in life! Yvonne April 10, 2019	dogs, homes needed. rescue, puppy, street dogs, urgent Animal Stories, Dogs Needing Homes Comments Off on URGENT – 2 Pups Need Homes.